It’s unbelievable that how just slightly over a year ago when Samsung first introduced its Galaxy Note, everyone thought it was a crazy idea for a person to use a 5” smartphone. Who would’ve thought that now, 5” is such a norm that almost all smartphone manufacturers already have or are working on phablets of their own. Star Mobile Sdn. Bhd. 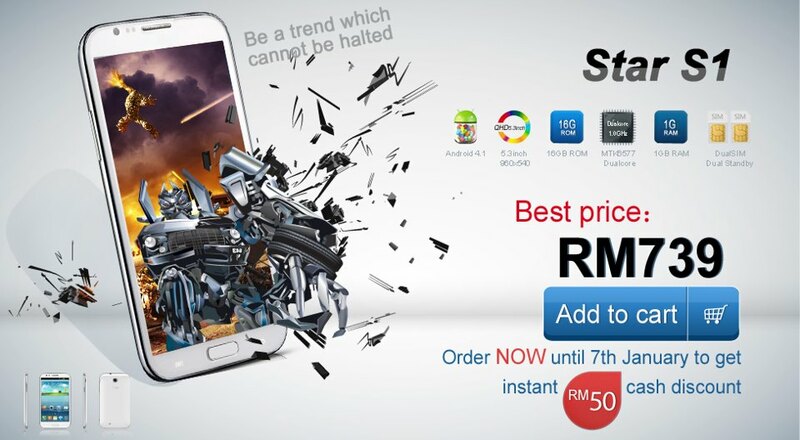 Recently introduced its 5.3” Star S1, the “most affordable Android smartphone in Malaysian market”. I’m sure you don’t need to be reminded of where the company gets its design inspiration from, the S1 runs on a 1GHz dual-core Cortex A9 processor from ARM and apart from having a large display with a resolution of 960 x 540, it also features a dual-SIM capability that allows you to utilize two different mobile plans simultaneously. Other specs include 2800mAh battery, Android 4.1 Jelly Bean, 1GB of RAM, 16GB internal storage with TF card expansion slot, 5MP rear camera, 0.3MP front shooter, and weighs 199g inclusive of battery. Price wise? Until 7 January 2013, the company is giving a RM50 rebate for all purchases at RM689. The normal price for a Star S1 with 16GB memory is RM739. More information about the device available in this link. HTC Malaysia Confirms: HTC Butterfly is "Coming Soon"